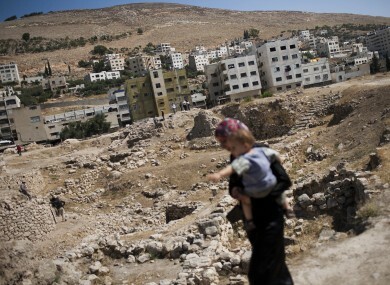 A Palestinian woman carries her baby in the city of Nablus near where the attack took place. AN 18-MONTH-old Palestinian baby died and his parents were injured in a fire started by Israeli settlers in the West Bank, Palestinian security officials said today. Four settlers set a house on fire at the entrance of a Palestinian village and scrawled graffiti on a wall before fleeing to a neighbouring settlement, the sources said. The family were sleeping at the time. BBC reports the child’s older brother and parents were severely injured in the blaze. Attackers are said to have scrawled graffiti near the house reading “revenge” in Hebrew. The Israel Defence Forces (IDF) said they are currently trying to track down the suspects of this attack. Extreme-right Israeli activists have committed acts of vandalism and violence against Palestinians and Arab Israelis for years, attacking Christian and Muslim places of worship and even Israeli soldiers. The attacks are known “price tag” violence – a euphemism for nationalist-motivated hate crimes by Jewish extremists aimed at Arab property. - © AFP 2015 with reporting by Michelle Hennessy. Email “Palestinian baby killed in fire started by Israeli settlers at his home”. Feedback on “Palestinian baby killed in fire started by Israeli settlers at his home”.